Many schnoodle dogs inherit sensitive skin from their schnauzer and poodle relatives. Dogs with sensitive skin often experience dry, tender and itchy skin in reaction to harsh grooming products, allergies or climate changes. Once you eliminate the potential irritants from the dog’s environment, his skin will improve. You can prevent uncomfortable skin reactions with the right products and a gentle grooming routine. This guide will teach you how to keep your schnoodle’s sensitive skin healthy. Take your dog to the veterinarian to rule out serious skin conditions that need medical attention. Find out the cause of your dog’s sensitive skin. Schnoodles are prone to canine skin problems such as scaling, pimples, bacterial infections, folliculitis, dermatitis or dry seborrhea. Dogs with allergies may also have itchy skin and hives. Dogs with sensitive skin sometimes have reactions that resemble some of these conditions. 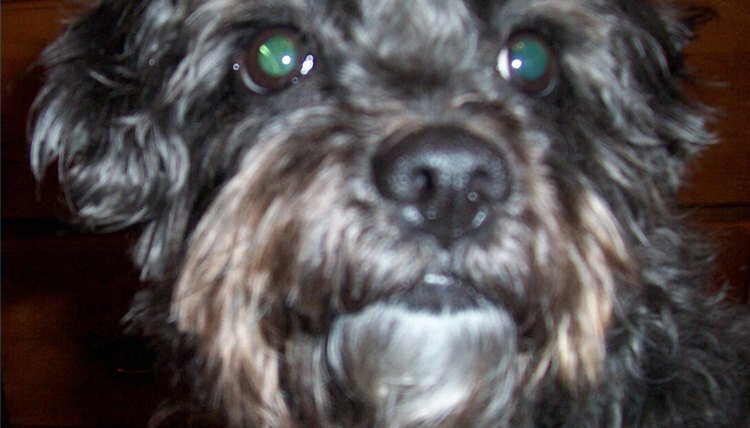 Some schnoodles simply have chronic dry skin. The veterinarian can evaluate your dog’s skin condition and recommend appropriate treatment. Give your dog a canine omega fatty acid supplement. Schnoodles with sensitive skin benefit from supplements with high levels of omega-3 fatty acids. Use a mild soap-free hypoallergenic shampoo and a moisturizing cream rinse to prevent grooming product reactions. Wash your dog once a month. You can bathe your dog less if she does not get dirty. The American Society for the Prevention of Cruelty to Animals recommends bathing a dog every three months. Frequent bathing can dry out and irritate canine skin. However, if your dog is prescribed a medicated shampoo for a skin condition, frequent bathing may be necessary. Always follow the shampoo with a cream rinse to keep your schnoodle’s skin and fur moisturized. Brush your schnoodle dog’s fur regularly to distribute natural oils. Detangle large knots and mats with a fine-tooth dog comb. Remove the remaining tangles from your dog’s coat with a slicker brush designed for fine fur. Brush your dog’s fur with a natural bristle dog brush until the coat shines. The shine indicates that you have spread the natural oils throughout your dog’s coat. If you brush the dog’s fur daily with a natural bristle brush, you may not need to detangle with the comb and slicker brush. Moisturize your schnoodle’s fur and skin between washes with olive oil. Pour a pea size amount of olive oil in your hand and rub your hands together to emulsify. Massage the oil into your dog’s fur and skin. Brush your dog’s fur with a natural bristle brush to completely distribute the olive oil. Only use grooming products designed for dogs to prevent skin irritation. Human products are harsh on canine skin because dogs have a different skin pH than humans. Always get veterinarian approval to give your dog nutrition supplements to prevent a conflict with diet or medication. Do not use a blow dryer to dry the coat of a dog with sensitive skin because the heat is too harsh. If you must blow dry her fur, set the dryer to warm and dry the fur for five minutes only. Air dry the dog&#x2019;s fur whenever possible. 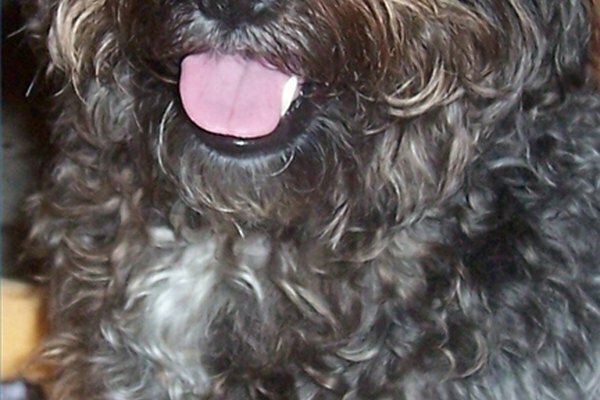 Most schnoodles have fine textured fur that dries quickly.